In a sport where championships can be won or lost by fractions of a second, the need for speed outranks everything. Away from the track, all of today’s Formula 1 teams have extensive partnerships with top technology firms as they look to gain the extra advantage that could make the difference between glory and defeat. TechRadar Pro headed to McLaren’s space-age Surrey headquarters to hear more on how one of the most famous teams in Formula 1 works with Dell Technologies in its push for victory. Located just outside the sleepy town of Woking, McLaren’s HQ wouldn’t look too out of place in a James Bond movie. The approach curves smoothly around a large lake which houses the water to cool the team’s multi-million pound wind tunnel, giving an all-round view of the streamlined building. The reception is home to many of the team’s title-winning cars across its 52-year Formula 1 history, with a glittering trophy cabinet filled with reminders of the team’s victories acting as motivation to employees heading to the building’s cavernous cafeteria. But the facility is also a buzzing hive of industry, home to engineers working 363 days a year in order to keep pace with the continually-evolving and improving sport. With such a keen pace of innovation then, it’s vital that McLaren has a reliable and stable technology partner to handle the mountains of data it generates from testing on a daily basis. “We’re very fortunate to have a great partnership with Dell,” Karen McElhatton, McLaren Group CIO told TechRadar Pro at a media event ahead of this weekend’s British Grand Prix. 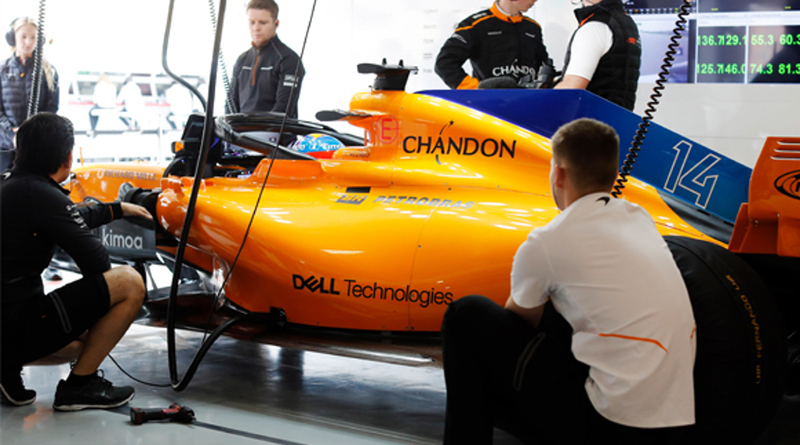 With teams limited on the amount of processing power they case use in testing and development, the need for efficient yet powerful hardware is paramount – and the reason McLaren values its partnership with Dell so highly. Each car ultimately generates around 1TB of data over the course of a full race weekend, both via the myriad of sensors attached to the vehicle, but and also through HD video of the cars in action during practices sessions. Thanks to Dell’s hardware (including the newly released PowerMax servers) this video can be transmitted quickly back to the engineering teams at McLaren HQ for real-time analysis, allowing for quick decisions that could make all the difference during a race. McLaren’s relationship with Dell stretches across the entire McLaren Group, which alongside Formula 1 activity also includes the company’s road vehicle and Applied Technologies arms. The latter looks to take learnings from Formula 1 to apply to other real-world situations, spreading the knowledge gained from the sport to slightly more pedestrian areas. McElhatton mentions utilising data to allow aircraft to move more smoothly, optimising logistics transportation and even healthcare recovery as varied examples of where McLaren’s knowledge has moved from the race track to the real world. There has been much debate recently over whether Formula 1 has become too technical, if the drivers and races have become too robotic, but McElhatton disagrees. Overall, although McLaren’s Formula 1 season may not be resulting in trophies just yet, the company is certainly one of the leading lights when it comes to technical development and innovation.